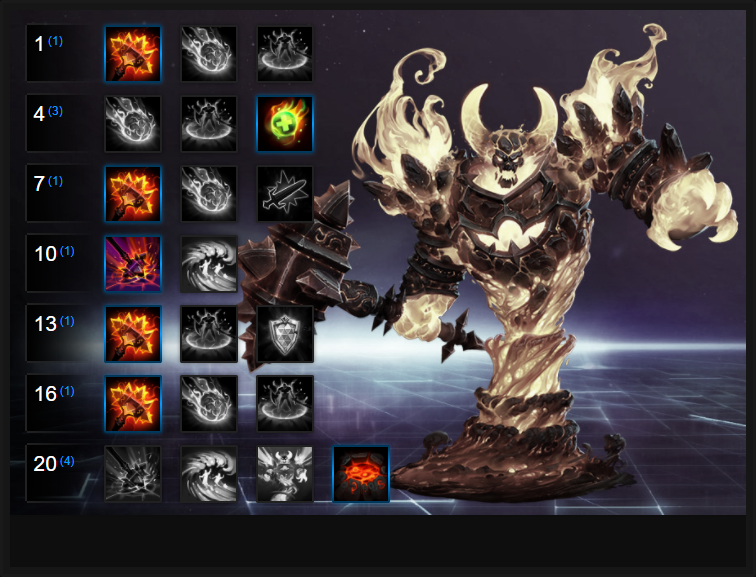 In this Ragnaros Build Guide, we provide an overview of his strengths, abilities, talents and matchups. Raganaros is a melee assassin that not only brings a unique Trait to Heroes of the Storm, but offers a considerable amount of damage and control. He sits somewhere between Thrall and The Butcher in terms of damage, utility and poke. That might sound a little odd, but Ragnaros not only has some self healing, but he’s excellent at charging in before dealing burst damage. I have to admit that Ragnaros is unquestionably one of the most fun Heroes I’ve played in Heroes of the Storm and he comes at a time where Battlegrounds are getting larger and the rise of two Warriors returns to team compositions. His ability to not only buff his allies to increase their speed, but to also have excellent lane clear and sustain, as well as poke in team fights, allows him to easily rival the most picked for a team pace. What’s particularly interesting about Ragnaros is the fact his Trait allows him to effectively take over a Fort and become a raid boss. During this time not only does he gain new abilities, but it allows him to comfortably defend a Fort like no other Hero. Understandably and due to the strength of this transformation, his trait has a lengthy cooldown. Despite that, Ragnaros has a kit that’s flexible and powerful. Molten Core (Trait) - Allowing him to transform into a raid boss on a Fort, Ragnaros gains enhanced versions of his own abilities ensuring that he can defend with far greater potency. What’s particularly effective about Molten Core is the fact you gain a large health pool throughout its duration, though this depletes over time or until you manually cancel your occupation of the Fort. I would advise that you try to use Molten Core to save your towers and gate, not just the Fort. These can buy you significant time when the enemy team wants to make a push so don’t just wait for them to fall before you fortify your lane. Empower Sulfuras (Q) - As described, Empower Sulfuras allows Ragnaros to cast an instant basic attack. Not only will you immediately swing against your foe, but you’ll also cause AOE damage to those around it. The healing component is 20% against minions but doubled against Heroes. Considering Empower Sulfuras has such a small cooldown, it’s invaluable for wave clear. Just be conscious of the fact that to really maximize its damage potential you want to ideally use a basic before then triggering Empower Sulfuras for a quick double-hit. Living Meteor (W) - Acting similarly to Cho’galls Rune Bomb, Living Meteor allows Ragnaros to call down a Meteor and target it to roll in a specific direction. Its radius is fairly generous but its movement speed quite slow. The best way to look at it is that it provides some area denial, potentially good damage against Heroes who aren’t paying close attention, or poke from afar. What I will say with Living Meteor is that it’s often best saved until enemies are hit with crowd control (such as E.T.C’s Mosh Pit or Malfurion’s Entangling Roots). Sulfuras Smash (Heroic) - My preferred Heroic simply because of its ranged poke, team fight potential and stun, Sulfuras Smash allows Ragnaros to drop his hammer down from the sky after a brief delay. Any enemies hit in the center are briefly stunned and take damage, while those on the edge of the circle take reduced damage. If you’ve a good aim, it’s amazing for sniping down enemies on the back line, is invaluable for interrupting Heroes who are channeling abilities. If you can, try to save it for key moments where enemy players are grouped together or to finish off a low health Hero who’s attempting to back off. Lava Wave (Heroic) - Causing a huge wave of lava to crash from your core down one lane, Lava Wave is a defensive ability that allows you to deal huge damage to incoming minion waves. It can’t harm structures but deals enormous damage to minions and Heroes caught in its way. I have to admit it’s fantastic on large maps where the enemy might split push and send a minion camp down your lane while you fight over an objective but at endgame, it falls off a fair bit. Most Heroes can avoid it easily and will see it coming while I’d much rather have value in a team fight from Sulfuras Smash. Empower Sulfuras is a key part of Ragnaros' wave clear and sustain. Sulfuras Hungers is a straight damage increase and when the quest is fully completed, boosts the damage by 90. It's really easy to complete and especially quick on small Battlegrounds such as Tomb of the Spider Queen. Having higher base damage on your primary ability is never a bad thing. Catching Fire is a good talent as it allows you to mitigate 25% of incoming damage that you can activate. Considering you'll regularly be on the front-line, against high damage teams or if under heavy pressure, it can save your life. Variable: Ragnaros has no default means of keeping players in place so taking Slow Burn provides him with some much needed crowd control. Slow Burn causes his Blast Wave to slow by 40% for 2 seconds when it detonates, allowing you to stick to players much easier. Just be sure to be next to them when Blast Wave explodes. Building on Empower Sulfuras, Hand of Ragnaros allows you to reduce the cooldown of your Q while gaining a refund on your mana as long as you hit 2 or more enemies. It's fairly easy to do in a group setting and allows you to use your highest damage ability much more. Variable: Increasing the damage of Blast Wave by 100%, Superheated is a welcome damage boost that can seriously pressure a target 1 on 1 or cause real misery against grouped opponents. It's a high damage talent that only helps to improve your damage output. Causing AOE damage and stunning anyone caught in the center, Sulfuras Smash is amazing in a team fight. Whether poking an enemy trying to run or used against a group caught by crowd control (such as Malfurion's Entangling Root) it's amazing. Variable: On large Battlegrounds Lava Wave can be particularly strong. It can allow you to comfortably lane push without needing to be there and if used on a lane you're fighting in - if the enemy team aren't concentrating - it can easily wipe them if they aren't looking. Purely because this build focuses so much on Ragnaros' Empower Sulfuras, Cauterize Wounds allows Raganros to heal for 40% more of the damage dealt from his Q over 2 seconds. It's fantastic for sustaining yourself in and after a fight. Variable: If you're pursuing a E build (based on the other variables above) taking Tempered Flame allows you to gain a shield based on 100% of the damage dealt with Blast Wave. Lasting three seconds, it provides good mitigation 1 on 1 but against a group - it's incredible. If you can hit multiple targets, the shield you'll gain is huge. Variable 2: Resilient Flame is a good alternative against a very stun heavy composition. Receiving 50% reduced damage when stunned is fantastic and provides some much needed survivability. Acting as a damage multiplier based on maximum health, Giant Scorcher deals 9% of an enemy heroes health, as damage, over 3 seconds. Thats pretty massive. Variable: Causing your Blast Wave to detonate twice, Blast Echo utilises talents at 4, 7 and 13, ensuring each Blast deals 100% extra damage, slows and provides shielding. You can effectively double up on everything and when you manage to hit multiple foes, your shield from Tempered Flame can be huge. Enormous group pressure during any team fight. Acting similarly to Dehaka's Burrow, Submerge is amazing for mitigating damage and replenishing your health. Whether you're avoiding an ability or simply to heal up, it's an amazing talent. Variable: Flames of Sulfurion is a good alternative if you have the follow-up damage for your stun. Increasing the stun duration of your Heroic by 0.5 but also slowing all targets hit by 50% for 2 seconds allows you to seriously turn the tides. These Hero Threat Levels (1 being lowest threat and 10 being highest threat) are to help you determine which enemy Heroes can give you a headache. For the Heroes listed here, take extra care as they're particularly dangerous for Ragnaros. The Butcher: His healing is better than yours and if he uses his Heroic to silence you, you're in serious trouble. Illidan: Evade, self healing, mobility, damage - he's a headache you just can't get rid of and your self-sustain won't save you if caught without Blast Wave. Greymane: His burst is huge and his poke not too shabby - if he kites well. This list of tips and tricks are just a handful of things we think will help your Ragnaros play. We'll continue to add to the list as required and if you have any tips you'd like to share, let us know in the comments below and we'll place them here. 1. Don't be afraid to use Empower Sulfuras as often as possible when laning. It provides a heal, is amazing for clear and has a very low cooldown. It's also pretty cheap on mana. 2. Blast Wave provides a movement speed boost of 25% but it only lasts a brief second - use Blast Wave when you're already in touching distance of your enemy. 3. Ragnaros' only ranged poke is Living Meteor. It has a lengthy cooldown and is fairly easy to evade. Use it to soften up minions in lane early game before finishing them with Empower Sulfuras. 4. Ragnaros' lack of quick poke does leave him vulnerable to fast moving Heroes. If you can, try to pressure them with a well placed Living Meteor to force them to change positions, before catching them with Blast Wave. 5. Your Heroic, Sulfuras Smash, is ideal for preventing an enemy from escaping. Just be sure to lead your placement so you aim slightly ahead of their movement - it has a brief delay before landing. 6. Ragnaros has huge burst but needs to be in amongst the action to deal it. Try to flank in order to take the enemy by surprise. 7. You cannot go toe-to-toe with Heroes such as The Butcher, Varian or Thrall. They simply have too many means of defending themselves, or healing. Play around your Living Meteor and use your Heroic. 8. Always try to save your Heroic for a team fight and be sure to have it ready when your team uses crowd control. You can then instantly follow up. 9. A quick way of casting Blast Wave on yourself is Alt + E.
10. Blast Wave can be cast on minions or allied Heroes. You don't have to use it only on yourself.